On 1 February 2014, 17 people were arrested following a large-scale military raid in Sasawa village in Yapen island, an area thought to have a heavy presence of TNPB (Tentera Nasional Papua Barat, West Papuan National Army). 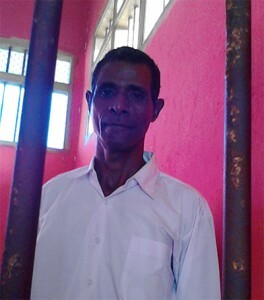 Seven out of the 17 people remain in detention – Salmon Windesi, Peneas Reri, Kornelius Woniana, Obeth Kayoi, Rudi Otis Barangkea, Jimmi Yermias Kapanai and Septinus Wonawoai. Those arrested were suspected of involvement with the TNPB. According to information received by human rights lawyers, it is common for armed groups to coerce local communities into providing them with material support such as food, transport and other assistance. Human rights lawyers with ALDP interviewed six of the seven detainees which revealed the torture they faced on arrest. Security forces chained the men together and tied their hands, making them crawl on the ground. When being forced into the police truck, Barangkea was threatened with a bayonet placed against his cheek and neck by a military officer. The officer repeatedly threatened him and said, “I’ll slice your neck until it snaps.” Kapanai was stamped on his ear until it was bloody. They were also electrocuted with stun batons. Windesi described the tying of their hands felt like “being splashed with hot water” and created blisters. He was also hit at the back of the head with a pistol which made him collapse and faint. The men were repeatedly kicked, beaten, hit with pistols and stomped on with jackboots. Reri stated that he was electrocuted in the mouth and then repeatedly elsewhere on his body. Police also confiscated IDR 900,000 and two handphones from him.